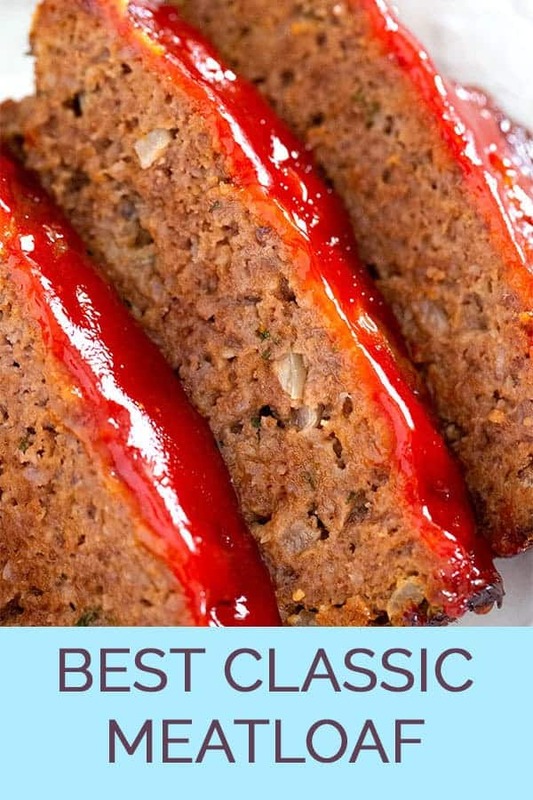 The best meatloaf recipe ever! 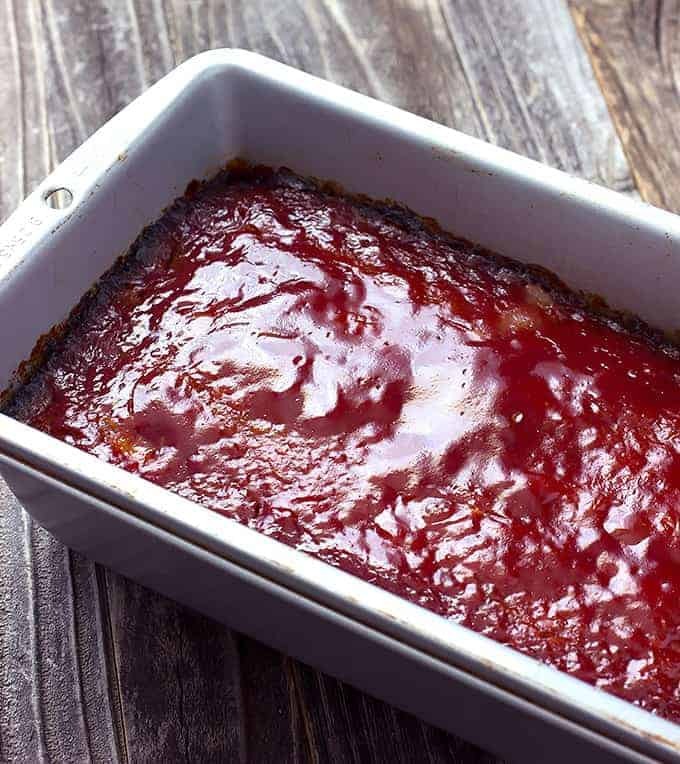 This traditional meatloaf recipe is just like mom used to make, made with ground beef and a sweet and tangy glaze topping. 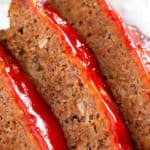 What makes really good meatloaf? I think the trick to good meatloaf is using lean ground beef. 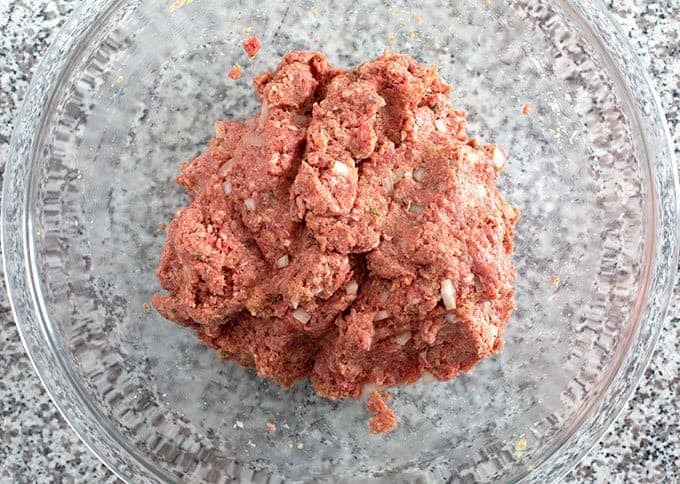 The problem with a lot of meatloaf recipes is that they call for ground beef with a high fat content. As the meatloaf cooks, the fat cooks out and makes a greasy mess. 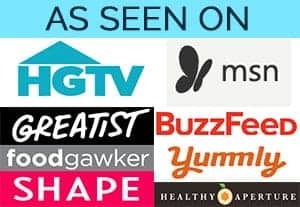 Not this recipe! 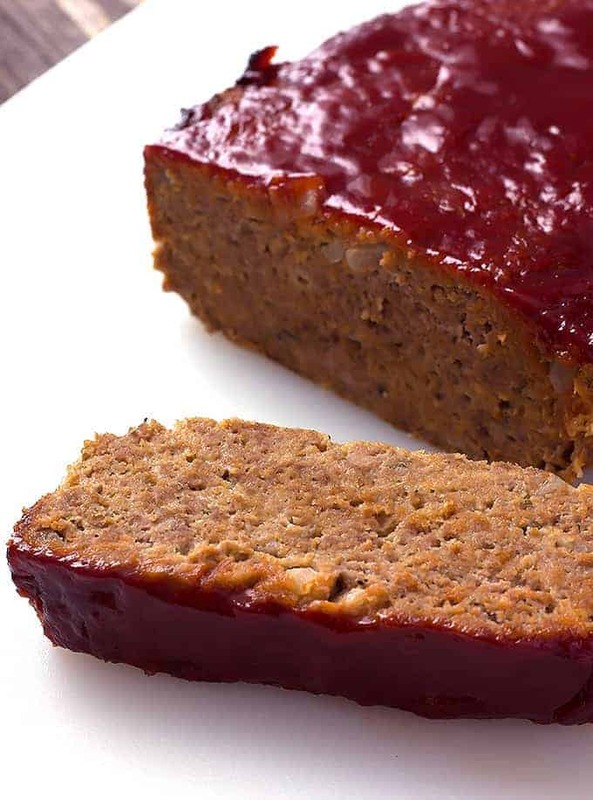 You may be thinking, but won’t lean ground beef make the meatloaf dry? Not at all! The milk, egg, ketchup, and diced onion in the meat mixture are all working to keep the meatloaf moist and delicious. This classic meatloaf is perfect for a busy weeknight meal because it can be prepared in minutes. The only thing to chop is a 1/2 cup of onion. Sometimes I like to prepare this meatloaf recipe ahead of time. Just cover the loaf pan with plastic wrap and refrigerate it until you’re ready for it. Then, uncover it and let it come to room temperature as you’re preheating the oven. Add 90% lean ground beef to a large bowl. Add dried bread crumbs and some diced onion. Add milk, an egg, ketchup, and worcestershire sauce. Add dried parsley, garlic powder, salt and pepper. Mix it together REALLY well. 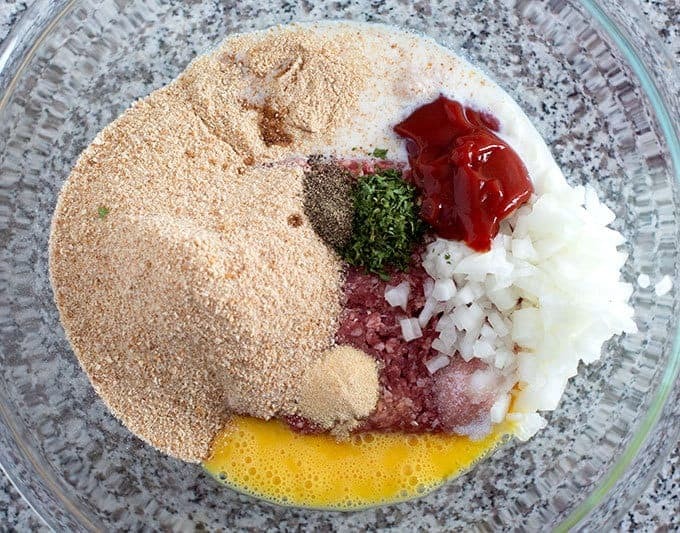 Pour the meat mixture into a loaf pan. Spread it into a flat even layer. Add ketchup, brown sugar, and red wine vinegar to a bowl. Pour the glaze over the meatloaf. 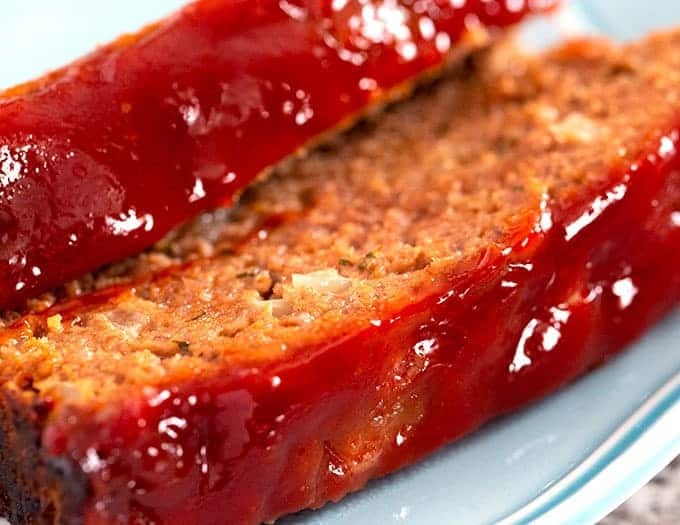 Check out the step by step video for this meatloaf recipe below. 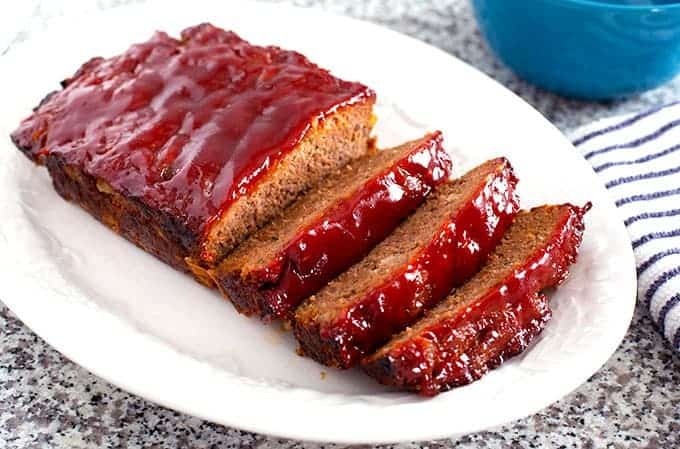 This traditional meatloaf recipe is just like mom used to make, made with ground beef and a sweet and tangy glaze topping. 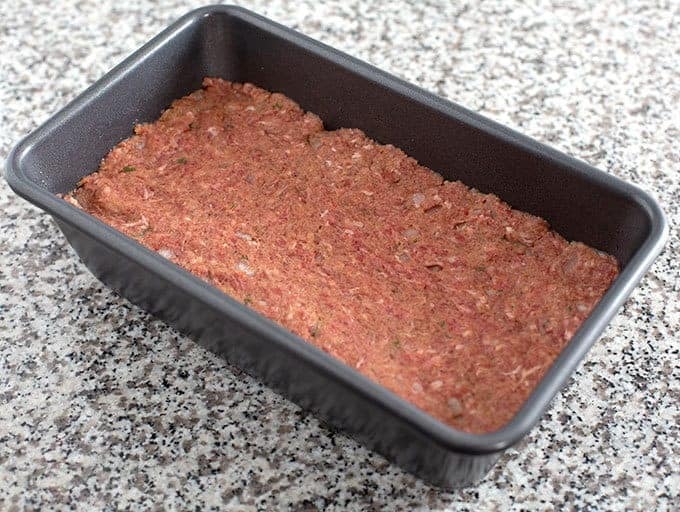 Add the meat mixture to a loaf pan. Pat the meat down into an even layer. In a small bowl, add 1/4 cup ketchup, the brown sugar, and vinegar. Stir to combine. 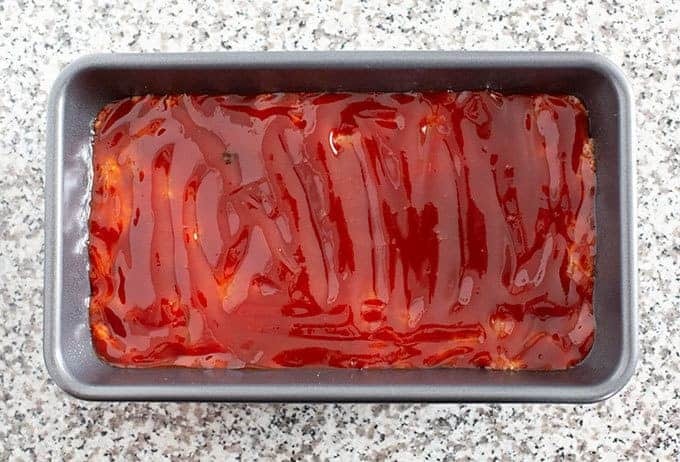 Pour the sauce on top of the meatloaf and spread it into an even layer. Bake uncovered for 55 minutes. *Be sure to mix the meat really well. This is a very moist meatloaf recipe so under mixing can cause the meatloaf to be too soft/mushy. 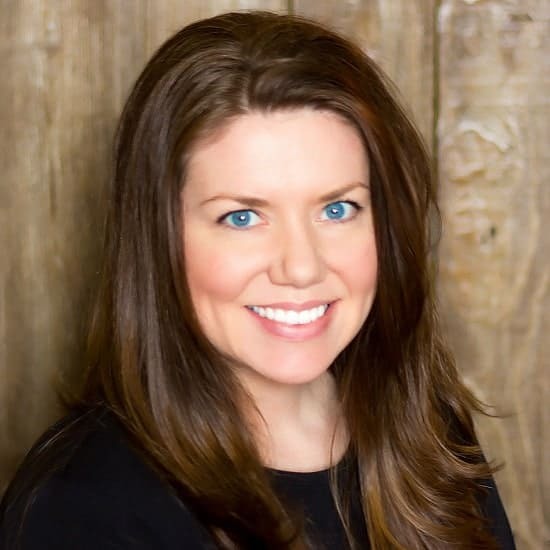 **I use two thin spatulas to remove the meatloaf from the pan and transfer it to a cutting board. You could also slice and serve the meatloaf directly from the loaf pan, or use parchment paper to line the pan for easy removal. Everyone loved it! I double the recipe and cooked it in a baking dish which I divided lengthwise so the mixture wasn’t spread too thin. I added about 15 minutes to the cook time. I made this last night 4/ 4/19. It was sooooo good! Moist and had a wonderful flavor. I really liked the tangy topping, so much better then just ketchup. I didn’t change a thing on this recipe, it was perfect! Second time making this. Absolutely love it! Only thing I do different is swap the brown sugar for honey . I tried this recipe tonight. It was delicious! However, I do have an issue with the prep time. It was more like 70 minutes for me. Mixing the ingredients alone took nearly 10 minutes. In addition, I don’t drink milk, so I don’t have any. I used wine instead (same amount as milk). I don’t know what it tastes like using milk, but as I said, it was delicious. I also didn’t have garlic powder, so I just minced a couple of cloves very fine. I used both beef and pork which made it 1 lb, 9 oz, so I added 10 minutes to the cooking time and verified the result with a thermometer. I greased the pan with shortening so it wouldn’t stick, and it didn’t. Not wanting to slice it in the pan with a metal knife, I removed a couple of slices using a silicone spatula which made the remainder much easier to extract. fwiw, the wine was also quite useful during the prep by keeping me relaxed. All in all, a great recipe! The consistency and moistness were perfect. The best meatloaf I’ve ever had! It took you 70 minutes to beat an egg and dice a half of a onion? The prep time was accurate….do you mean total time? 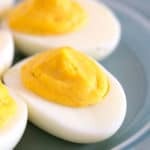 I don’t want others to get discouraged thinking it takes 70 minutes to make this delicious recipe. Made this for dinner today. It was awesome. So easy and delicious. We even had everything already. Didn’t have to go to the store for any ingredients. This is my family’s new favorite meal!! Made it twice in one week !! It’s the best!! My meatloaf never comes out the same twice, I get creative sometimes Italalian, stuffed patted out flat with mozzarella and spinach and rolled up and use pizza sauce. Sometimes taco with salsa meat loaf is actually a canvas, use your imagination. Just made this and it is absolutely delicious!!! I just made this & it is AMAZING! Ty for posting this recipe! Have now made this for the second time. Being domesticly challenged, I had my doubts. It was great – tasted like someone else had made it!! I made just a couple of changes, I crushed some garlic and butter croutons and eliminated the garlic powder and instead of ketchup, I used Diana Sauce Gourmet Original. Don’t want to brag, but it was sooooo good! Thanks for adding to my edible repetoir. This is the absolute best recipe for meatloaf. Ive made this recipe for over 20 people and get raves. I point to the recipe-without any changes whatsoever. This was outstanding. I used venison burger and this turned out terrific. A quick, easy-to-follow recipe perfect for an after work, mid-week dinner. I’ll use this recipe again. I’m making it with venison tomorrow. I’m going to put it in the smoker. Have made it several times with beef. 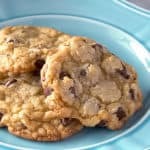 I use oats that I grind into a flour consistency (my daughter has celiacs and can’t have wheat) It has been great every time. I am making this today for the second time. I love it. Quick and easy. Freezes great, of course, and also delicious in a sandwich. The recipe was so easy! No one in my family likes onions so I used dried onion instead just for the flavor and that way no one had to bite a chunk of onion which would have been an issue for them lol! I can’t wait to see what it tastes like! I like the meatloaf mix with pork veal and ground beef. I usually just use ground beef and this mix really has a better all around taste. Recipe was good but needed some extra taste, I put an envelope of Lipton Onion soup mix the second time I made it and it was perfectly seasoned. It’s so delicious…I actually added this recipe into MyFitnessPal, but as far as servings go, I think 4oz is a more realistic serving size. 1/10 of the meatloaf is 1.6 oz. – I’d walk away from the dinner table hungry! 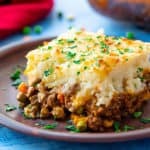 So, I consider this recipe – made with 1 pound of ground beef – 4 servings at 364 calories (per serving).Yummy! My son and I made this last night, and it was delicious. Thank you! We made extra sauce to have on the side. I think it would serve 5-6 people, not 10. My family said to definitely make this again – it’ll be my go-to meatloaf recipe from now on. Just made this tonight. Doubled the recipe, made two loaves. Everyone enjoyed it! I used Red wine as I did not have red wine vinegar, was very tasty! Did not have enough bread crumbs, so I used premium plus crackers, and scaled down the salt a bit. I think next time I will mix the mixture better, and longer. Very nice. Thank You. You weren’t kidding that this is the best meatloaf! I followed the recipe exactly and it was absolutely perfect. The sauce on top is delicious but really the meatloaf is so good it doesn’t even need it. Thank you for an excellent recipe. Superb recipe. Delicious. Tried it today. Used minced garlic instead of garlic powder & white wine vinegar. Product turned out like you mentioned. Fantastic meatloaf!! Love this so much, it’ll be a favorite of ours from now on!! Thank you!!! It looked amazing, the texture was wonderful and I enjoyed it, but my family thought it was too sweet..and that’s from kids who put tomato sauce on everything! I thought by making my meat loaf this way I would score big time. Even the fourteen year-old said when asked, ‘Well it’s not my favourite,’ and he eats lots of just about anythIng…with tomato sauce on it! So, I will go back to my old recipe which uses tomato purée which is not so sweet. I will definitely not use sugar in the topping glaze! Delicious! Last time I made meatloaf, my husband admitted that it didn’t taste very good. But he excused my poor cooking by saying, “It’s meatloaf – it never tastes good.” Well, I tried again with your recipe, and he loved it! Thanks! 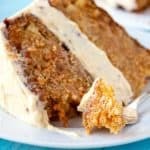 This recipe is terrific! 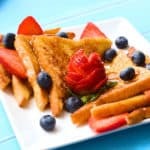 I substituted gluten-free breadcrumbs and almond milk to make this gluten-free and dairy-free. The entire family loved it.